For six years Sara worked with children and women, acutely aware that there were no special facilities for infants and toddlers in the city. 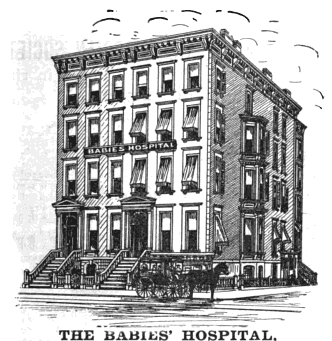 In 1887 she took steps to found the Babies’ Hospital of the City of New York. “It was thought that I would be able to take the medical care with my sister, Dr. Julia G. McNutt’s help,” she later recalled. But one neighbor on the upscale block was infuriated. Thomas B. Gifford went to court, contending “that the hospital was a nuisance in the neighborhood occupied almost entirely by private families.” He pointed out that children with contagious diseases would be a threat to the block’s residents. On June 18, 1888 Judge Beach, seemingly begrudgingly, ruled in favor of Gifford. He began saying “The hospital is not a nuisance prima facie;” but admitted “The care of children in numbers bring danger to the youthful members of families living near.” Most importantly, there was a covenant in the deed that restricted the property to residential use only. The officers of the hospital did not wait for Judge Beach’s decision. Because “many applications have been made for the admission of children, owing to the hot weather, during which the infant mortality is abnormally high,” they rented a house at No. 161 East 36th Street. By 1891 the Hospital had moved to two four-story houses at No. 657 and 659 Lexington Avenue, at 55th Street. Three years earlier Dr. Allan M. Thomas and Dr. William C. Denning had developed a three-foot by three-foot “hatching cradle"—the precursor of today’s incubator. The Babies’ Hospital owned the now-improved model when a tiny premature infant was brought in in January 1891. The Hospital’s valiant attempts proved futile. Three days later the funeral of Baby Johnson, deemed by The Times “a mite of humanity,” was held in his father’s home on West 60th Street. Of the 214 babies that were admitted in 1890, 57 died. Often the condition of the infants was such that there was no hope of survival when they arrived. Nelson reported that on the day she arrived there were four “little Dutch cradles” in a bay window, one of which was empty. That child’s body had just been removed. She asked the nurse about the remaining three patients. She was informed that another name for marasmus was “starvation.” Further investigation explained the plights of the urchins. In 23 cases the father was unemployed; in five he was sick or hospitalized; “in one case the father was in prison; in fifteen cases the mother was deserted by the father.” Two mothers were insane; in six cases the mothers were dead and in another six cases she was too sick to care for the child. The demand for admissions far exceeded the facilities of the old brownstone houses. In 1901 the architectural firm of York & Sawyer was given the commission to replace the property with a modern hospital building. The firm filed plans for the “7 and 8-story brick and stone” building in January 1902. The anticipated cost was $80,000—more than $2.25 million in 2016. A lavish fund-raiser for the building was held in the home of Mrs. William Hamilton Harris at No. 306 West 75th Street on the afternoon of December 12, 1902. The wealthy socialites who attended were less interested in the fact that “tea will be served and Sherry’s Hungarians will play;” than in dolls. While demolition and construction were underway, the Babies’ Hospital moved temporarily into the Nursery and Child’s Hospital. On May 12, 1902 the New-York Tribune published York & Sawyer’s sketch of the building and gave readers an idea of what was to come. The basement would house a “disinfecting plant,” the laundry, kitchen and “servants’ dining room.” A dispensary was located on the first floor, as were a room for the “clothing committee,” offices and a clinic. The second floor was for staff. It held the nurses’ dining room and quarters for the hospital board, the secretary and the matron. Following the hospital’s completion, the Real Estate Record & Guide pointed to it as an example of the renewed interest in brick as the major component in building design. On February 14, 1903 the journal insisted “A distinct revival in favor of brick is observable” and pointed not only to the Babies’ Hospital, but to the new American Express building on Madison Avenue, and Public School No. 43 on Amsterdam Avenue, among others. Indeed, the building, completed in December 1902, strayed from the expected limestone or marble cladding of its Beaux Arts style. The porticoed entrance, on 55th Street, was located in the two-story rusticated stone base. A lush frieze of draping garlands undulated over blank medallions below four stories of variegated brick that created a textured façade. French-inspired cast iron balconies relieved the flat surface at the fourth floor. Above the copper cornice, supported on scrolled stone brackets, the solarium and laboratory were nearly hidden from street view. At the reception meeting it was announced that Mr. and Mrs. John Sherman Hoyt had promised $500 a year to extend the hospital’s work. The money would be used to provide home visitations, highly important because the condition of the infants often digressed when returned to their tenement homes. “It has always distressed us to send the patients back into their often miserable homes, there to continue their downward career,” explained Dr. L. Emmett Holt. Within only six years the facility was too small for its ever-growing work. In September 1909 York & Sawyer filed plans for a $10,000, eight-story annex to house the dispensary and nurses’ dormitory. The resulting addition was seamless; discernible only by the closest scrutiny. 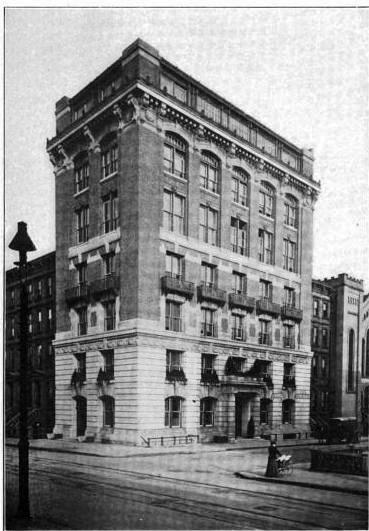 The pitiable circumstances of the parents who entrusted their children to the Babies’ Hospital was evidenced when a woman collapsed in the doorway of the East 51st Street police station on January 29, 1910. Mrs. Gertrude Lough was just 20 years old. Her husband, Thomas, was an unemployed carpenter who had not been able to find work for several months. Unable to pay their rent, the couple and their five-month old baby boy, Harry, had been evicted from their apartment three weeks earlier. The landlord took pity and allowed them to live in a vacant building on East 50th Street, as “caretakers.” They had a place to live, but no food. When Gertrude Lough was revived, she told police “they had had nothing to eat since Thursday, when they had a few crumbs of bread.” The week before Thomas found an odd job and earned $5. That was spent on milk for the baby and doctor bills and medicine for him. A doctor diagnosed the woman with “starvation and fatigue.” Dr. Arnold went to the Loughs’ rooms where he found Thomas holding the malnourished baby. Harry was removed at once to the Babies’ Hospital. In the meantime, back at the station house the police began passing a hat. Four prisoners, who overheard Gertrude’s story, asked to contribute as well. The men raised $15. And Dr. Arnold offered to try to find work for Thomas Lough. The heading bond brickwork results in a tapestry-like appearance. Perhaps the most publicized patient of the Babies’ Hospital was little Mary Margaret Roberts. She was born deformed on November 23, 1915 with an open spine, and was paralyzed from the waist down. Her mother, in serious condition following the birth, was not informed of her baby’s condition for fear of the shock the news would bring. In 1929 the Babies’ Hospital was absorbed by Columbia-Presbyterian Medical Center and left Lexington Avenue. The building at Lexington and 55th Street was converted to offices and retail spaces were carved into the street level. At some point the lovely cast iron balconies were removed; but otherwise the structure, with its tapestry of brick, survives relatively unchanged. Tom-fascinating. I've passed this building a million times and had not the slightest idea of its history. Another confirmation of why I start every morning with Daytonian.